April 24, 2018, New Delhi, India – On arrival at the leafy IIT campus in Hauz Khas, New Delhi, this morning, His Holiness the Dalai Lama was received by the founder of Velocity 48, Ms Parul Rai and actor Tisca Chopra. They escorted him to the auditorium where an audience of 1500 were waiting. On the stage His Holiness and his hosts lit a traditional lamp together to open the event. Moderator Sadhna Srivastav invited the Director of IIT Prof V Ramgopal Rao and IIT Executive Councillor Sanjeev Jain to formally welcome His Holiness with flowers and a white scarf. Ms Parul Rai explained that it has been her dream to provide opportunities for people to meet and listen to living legends so she was pleased that His Holiness had accepted her invitation. She added playfully that it was more by accident than design that the panel on stage with His Holiness were all women. In her words of welcome Tisca Chopra said she found it daunting to be speaking at IIT and introducing His Holiness who the New York Times has described as the most famous man in the world. She mentioned several questions she would like to have answered—is it our goal to be happy? can compassion be learned? and what is a well-lived life? Ms Srivastav invited His Holiness to begin his talk, which he did. “Respected dear sisters and brothers, several of my friends and in particular former Irish President Mary Robinson have called me the feminist Dalai Lama because I support women’s taking the lead at a time when we need to give greater promotion to compassion. Experiments have shown women to be more sensitive and responsive to others’ pain. We all come from a mother and most of us have survived as a result of her affection and care. “In human history, warriors, those who kill, have traditionally been male. Butchers are mostly male. So, as I said before, at a time when we need to make a special effort to promote love and compassion, I believe women have a special role to play. “As to the question of happiness and a stress-free life, every sentient being that experiences pleasure or pain has a desire to be happy. There are many different levels of happiness because animals, including birds, insects and fish, do not have the brains that we have. Their lives are entirely directed towards sensory experience. It’s what their survival depends on, which is why some animals have much sharper senses than we humans do. “Our basic human nature is compassionate and warm-hearted because that’s the way our lives begin. Without love and affection we would not have survived. Therefore, we need to combine our natural intelligence with warm-heartedness. Warm-heartedness brings inner strength and self-confidence, it enables us to be honest and truthful so our conduct is transparent, which attracts trust and friendship. “Our survival and our future depend on other human beings, who are our source of happiness. If I smile at this flower, it doesn’t respond. But if I smile at another human being, she or he generally smiles in return. Without showing a warm-hearted concern for others we can’t be happy. “As I already said, we have a marvellous, brilliant brain. But if this brain is driven by anger, competition and jealousy, it can be overcome by fear and anxiety. Dominated by self-centredness, we lack moral principles and a far-sighted approach. However, when we combine our intelligent brain with warm-heartedness, we respect others’ rights, sincerely wish them to be happy and never make trouble for them. His Holiness next turned his attention to India’s 1000 year old tradition of secularism, showing respect for all spiritual traditions and even for the views of those with no faith. All religious traditions convey a message of love and compassion, which can bring peace, happiness and satisfaction. And yet, since one billion of the seven billion human beings alive today have no interest in religion, these religious messages will not appeal to everyone. To do that requires secular ethics. His Holiness talked about theistic and non-theistic religious traditions. How the theistic traditions like Judaism, Christianity, Islam and some strands of Hinduism believe in a creator God who is full of love. Their followers believe that they too need to relate to the other beings God has created with love and compassion. He described this as a powerful idea. He went on to explain that non-theistic traditions like one branch of the Samkhyas, the Jains and the Buddhists believe that life has no beginning, therefore there is rebirth and karma. However, where Jains and Samkhyas believe in an atman, an independent self, Buddhism teaches selflessness, that there is no independent self, but a self merely designated on the basis of body and mind. 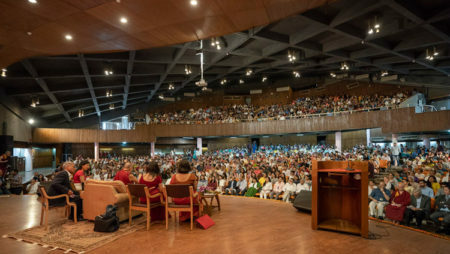 “The purpose of teaching about selflessness,” His Holiness continued, “is to help us tackle our emotions. My American friend, cognitive psychologist Aaron Beck, who works with people who have problems with anger, has told me that the feelings of negativity they have when they are angry are 90% mental projection. This corresponds with what Nagarjuna taught in terms of conceptual fabrication. As a student of Nagarjuna, I have personal experience that thinking about his explanation that nothing has any independent existence helps reduce the strength of disturbing emotions. This is another way to bring about peace and happiness. “At the same time, Shantideva, in his book ‘Guide to the Bodhisattva’s Way of Life’ explains how a self-centred attitude also gives rise to negative emotions like anger and that anger can be countered by altruism and warm-heartedness. Ms Nivruti Rai of the IIT Bengaluru moderated a question and answer session. His Holiness advised that human beings can change. They can, for example, examine whether anger and frustration have any value, coming to understand that anger is always unhelpful. However, compassion is an antidote to many disturbing emotions. Because anger and compassion are opposites, as one increases the other is reduced. His Holiness emphasized the importance of thinking about these things, reaching a conviction and becoming deeply acquainted with it. Asked how to remain strong when a loved one passes away, His Holiness recommended being realistic. Any living thing, he said, whether it’s a flower or our body, has a beginning and an end. Birth and death are part of life. He told someone else who was uncertain how to decide which course to follow that the first thing to do is to use your intelligence and think carefully about it without any sense of haste. Ask trusted friends for advice. In ways like this reach a decision and, he said, when you’ve done so, act on it with determination. His Holiness answered a question about why good and innocent people suffer by suggesting that in the case of those who are starving, it is because they are neglected by those who have the means to help them, but lack the moral principles to do so. Finally, a member of the audience asked if we are not all fundamentally selfish. His Holiness agreed that it is natural to take care of yourself, but recommended doing so wisely not foolishly. Given how dependent we are on each other it’s unrealistic to think only of yourself, so the wise way to fulfil self-interest is to look after the interests of others. As the meeting came to an end, His Holiness thanked people for coming to listen to what he had to say. He asked them to think about what they’d heard and to try to put into effect whatever they could of what they’d understood. The crowd pressed forward gently as individuals hoped to interact briefly with His Holiness who gradually made his way to the door and left the building to return to his hotel. Tomorrow morning, he will fly back to Dharamsala.